Magento 2 has been out in the wild for some time now. Most developers I know haven’t worked on Magento 2 project yet. However, most of them installed it and played around with it, learning and experimenting. 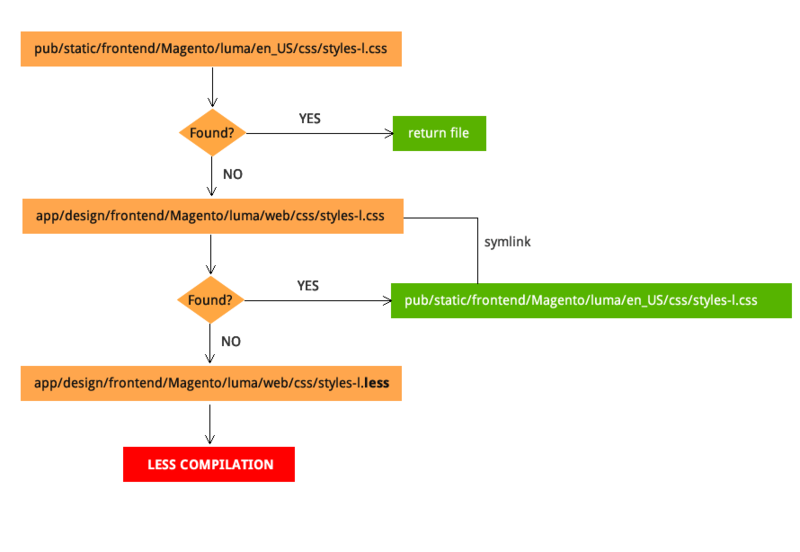 From the comments on github and social media, and from chats with developers, conclusion is that Magento 2 Frontend has a lot of issues, one being the most important: CSS preprocessing. How does it work in Magento 2? If you view source of default Luma theme homepage, you can see that main CSS files are located in /pub/static/frontend/Magento/luma/en_US/css/styles-l.css . Knowing that CSS and LESS files are actually stored in Theme directory, how did files end up there? You could write an extension which can use the same color, without even knowing what that color is. As you can see, extension developer can use the same color, even when he doesn’t actually know which color is that. OK, now you know why Magento implemented preprocessor, but you may be wondering why did they choose LESS, when you know that most of frontend developers use more powerful Sass preprocessor? There is no big mystery here: at the time of decision making, LESS was the only preprocessor with stable PHP compiler. I’ve tested Gulp combination, and compile with Gulp takes around 3-4 sec, which is again great time saver compared to PHP and Grunt compiler. If you hear the voices from community, most of them are asking for Sass+Gulp combination. While this is understandable, I still preach “platform” agnostic frontend. Complete separation of frontend, and allowing developers to use whatever tools and pre/post/no processor they want. Frontend tools and techniques are a moving target and are changing dramatically almost daily. Who knows what will the future bring. With CSS variables landing in all major browsers ( minus IE atm ), and with Chrome engineers working on new @apply CSS rule , I believe we will all write our code in vanilla CSS in the years to come. To wrap it up…the good thing is that community is talking about this, and Magento is listening… Let’s hope we will work out the best solution for all of us. In the meantime, feel free to get in touch and get our detailed custom report based on our technical audit. We would be happy to offer you some handy tips&tricks for improving the overall state of your store. I’m new to Magento but I’m having trouble using my own custom .less file and how does it compile to css and is it located. I have a custom theme with css folder. How to override _theme.less file inside custom theme from parent theme? I have crated a new theme and added _theme.less. Changes in _theme.less are reflecting but when i am trying to import custom less file in _theme.less, grunt is not compiling it. Any idea how to resolve it. Apprecaite ! very helping tutorial for the newbie of Magento2. Hopefully waiting for the Sass enabled Mage Core. For now untill scss will not be inside the core of magento 2 – I this the way approach is to use gulp with the less default files who comes with blank theme . So here’s my problem. I have my own theme, with Blank as the parent theme, and in my theme dir I have two .less files: file1.less and file2.less. When I do grunt exec for this theme, the \pub\static\frontend\\\en_US\css\source will be filled with symlinks to a lot of .less files, including the ones I mentioned above. However, if a Less file contains an @import, it will not create a symlink upon grunt exec, but a COPY of the file — regardless if it’s the standard @import method or the //@magento_import version. Hence, editing the original file will not change the one in the pub/static dir. Second question: what is the normal/recommended workflow when you’re working on a theme? As in, when/how often/in which order do you have to do grunt exec, grunt less, and static content deploy? Note: I’m on Windows, and when I do a static content deploy, it creates copies of the .less files in pub/static, but when I do grunt exec, it creates symlinks. For that reason, I usually try to avoid static content deploy. Thanks for this, however I am having issues getting Livereload to work. I have the livereload extension installed in my browser (Chrome), have enabled it, and am running “grunt watch” in my Magento installation, which runs without errors. However I am expecting my page to refresh automatically whenever I upload a file – currently this isn’t the case. Anything I’ve missed? Thanks for the guide, though I just followed the above and ran “grunt exec:mytheme” on the root of my Magento install, and received “gruntfile not found…..”. Any ideas? Great work..!! I would really appreciate it if you could tell me about the integration of wordpress and magento..is there any plugin or tool available out there?? I would be really greatful to you..Please.!! Thanks for the explanations, I just started a client project with Magento 2 and was very surprised how complicated the whole frontend setup is… It took me quite some time to understand how everything is connected and I doubted myself if I’m to stupid to understand it. And I used to work with GRUNT/SASS for some time now… Anyhow, thanks for the resources at the end of the article. I wasn’t aware of that. Great tutorials 🙂 I really appreciate this!